Harry Tummers: The Medieval Effigial Tombs in Chichester Cathedral. Reviews the accepted identification of medieval effigies in the cathedral. Uses 17C plan as base. Considers the evidence identifying the tombs of several medieval bishops some of which have been removed from their original locations. Also examines three tombs brought to Chichester from Lewes at the Dissolution and identifies them. Carol Galvin & Phillip Lindley: Pietro Torrigiano's Tomb for Dr Yonge. 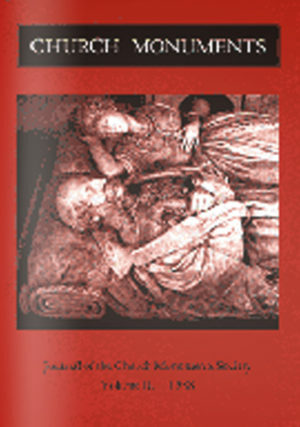 Discusses tomb of John Yonge d. 1516 at the Rolls Chapel – the first fully developed Renaissance tomb in England. Probably designed by Pietro Torrigiano, the effigy is of polychromed terracotta. Comparison is made with tomb of HenryVII and Elizabeth of York at Westminster by Torrigiano. Describes the analysis of paint layers on the effigy and reconstructs the original polychromy. Mark Stocker: The Church Monuments of Joseph Edgar Boehm. Examines the eclectic church monuments of Queen Victoria’s Sculptor in Ordinary. He produced 57 monuments including Earl of Cardigan 1868-70 at Deene, Northamptonshire commissioned by his widow, Princess Alice 1878-80 at Frogmore, Duchess of Westminster d. 1880 at Eaton Hall which has 15C Renaissance antecedents. More famous because of its location and subject was Boehm’s monument to Arthur Stanley, Dean of Westminster 1882-4. Also examines Howard tombs at Lanercost Priory, Frank Holly 1888-93 at St Paul’s Cathedral and Benjamin Disraeli at Westminster Abbey.